January in Chicago is usually a snow filled, runny nose, down parka kinda month. This month we have been BLESSED with miraculously mild weather. I really don’t know what the heck is going on, but I’m not complaining…. Needless to say, while we aren’t buried in snow it certainly is a far cry from a tropical situation here. And it’s this time of year, even void of the snow, that I crave things like…oh, cozy comfort food…maybe some gooey and delicious rice pudding. You read that right. Come on, it’s delicious! 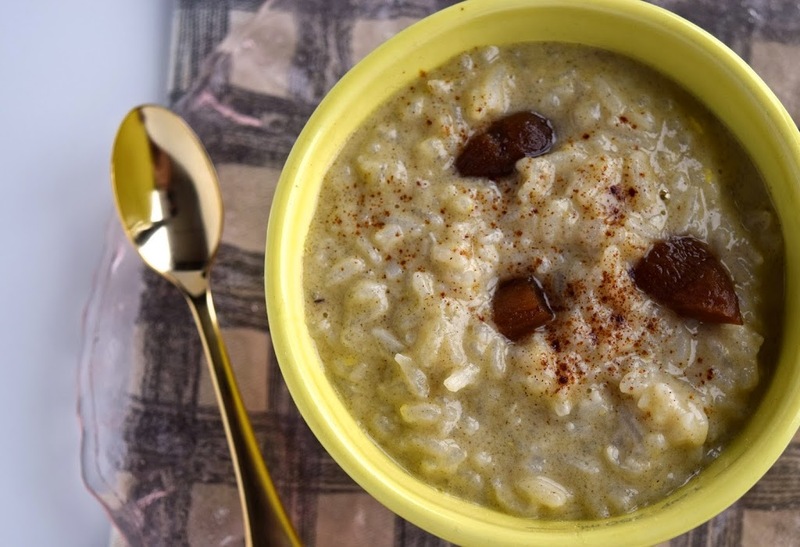 But you can’t just make boring old rice pudding. #lame You have to sass it up! So I decided to add some warming and lovely spices like cardamom and cinnamon. And why use regular milk when you can use coconut milk, which lends a delightful velvety texture and just a hint of nuttiness to the pudding?! And, we really shouldn’t stop there. I mean, if you are going to the trouble of making a delicious rice pudding then maybe you should also include something extra jazzy like some brandy or cognac soaked apricots? 1. 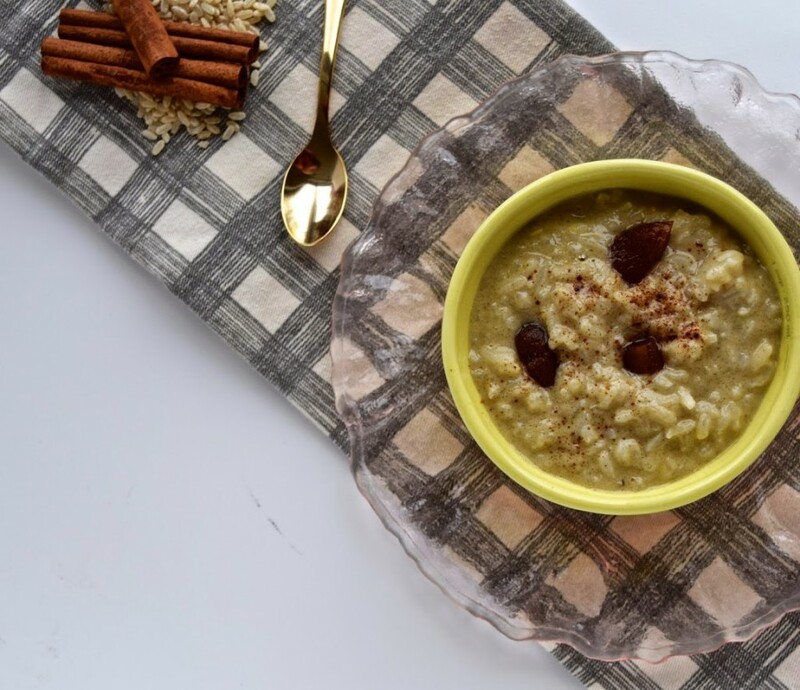 Add rice, salt, the 1 ½ c. reduced fat coconut milk , ¼ c. water, the broken cinnamon stick and the cardamom pod to a medium saucepan and simer, stirring occasionally, until rice is cooked through and liquid is absorbed. This should take about 18-20 minutes. 2. Meanwhile, gently mix together the egg yolks, 1 c. full fat coconut milk, vanilla extract, ground cinnamon and 1/3 c. sugar. 3. Add a big spoonful of the hot rice mixture into the bowl with the egg yolk-coconut mixture and stir to blend. Do this 2-3 more times and then gradually pour that mixture into the medium saucepan. 4. Put heat back on low and, while continually stirring, cook another 8-12 minutes until nice and thick. Remove from heat, remove the cinnamon sticks and cardamom pod from the pudding and pour into individual bowls and cover with either parchment or plastic wrap directly on the surface to prevent a “skin” from forming. 5. While that’s cooling, heat the brandy just barely and add the apricots (this will help them plump up faster). Let them soak until the pudding is ready to eat. Stir some of these into each pot of pudding and gobble up! *To make coconut free simply substitute your favorite dairy free milk for the coconut milk! **To make egg free eliminate the egg yolks and replace with 1 T. tapioca or arrowroot starch! PS-use the boozy soaking liquid to make a delicious cocktail. Don’t throw it out!